Our starter guide to playing Bomb Hunter in the Boomsday meta. 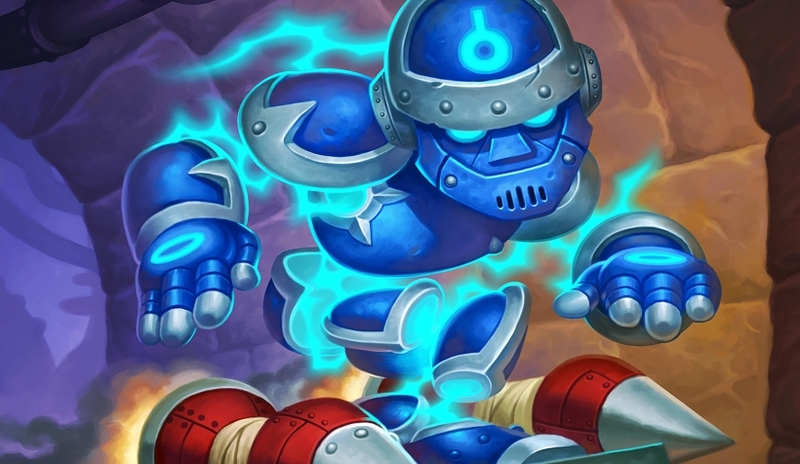 Our Bomb Hunter deck list guide features the best deck list for Season 53 of Boomsday (August 2018). Our Bomb Hunter guide also contains Mulligan advice, card combos and strategy tips. Bomb Hunter is a Hearthstone deck that goes all-in on the cards which synergise with the Goblin Bomb mechanic. By doing so you hope to find yourself flinging a disgusting amount of damage into the opponent's Health pool as those bombs are detonated one by one...or all at once with Void Ripper. In the second edition of our guide to playing this new archetype, we're highlighting a popular deck list that has been created and play-tested in the live Boomsday meta. It'll be tweaked as a more refined version inevitably comes to light in the days and weeks following the launch of the new expansion. We've also got a broad overview of the strategy involved in playing Bomb Hunter, although we'll have more detail for you in a future update, along with Mulligan advice. In the meantime you should find the combo breakdown at the bottom of the page useful in helping you understand what makes the deck tick. We've replaced our original deck list with one created by Thijs for the live Boomsday meta. We'll keep tracking this one for as long as it remains competitive in the new meta. We've also updated the rest of our guide to reflect the changes that have been made. This deck makes full use of the Mech, Goblin Bomb and Magnetic synergies that now exist for Hunters with the arrival of The Boomsday Project. As the name suggests, however, the deck is first and foremost built around those Goblin Bombs which can be generated by cards like Whirliglider, Explodinator and - most significantly of all - Boommaster Flark. Those little bombs might not look too intimidating in their own right, but when you consider that Deathrattle in the context of cards like Void Ripper you can see the potential for massive face damage. You also have a host of Magnetic cards which can be used to empower all of your Mechs even further. In aggressive match-ups you can make use of cards like Bomb Toss and Fireworks Tech to keep the opponent at bay, with other sticky Mech support coming from cards like Wargear and Spider Bomb. Times are tougher against slower, control-orientated opponents which is why we now have a meatier late-game presence in the form of Deathstalker Rexxar. Beyond vanilla Beast minions, you now have the creatures generated by Animal Companion to weave into the mix. This section will be updated with Mulligan advice once the Boomsday set has gone live. - The following cards are all capable of generating Goblin Bomb minions: Bomb Toss, Boommaster Flark, Whirliglider and Explodinator. - Magnetic minions can be placed to the left of a friendly Mech if you want to fuse the two together, or to the right if you want to keep them separate. The following cards in this deck have the Magnetic keyword: Venomizer, Spider Bomb, Wargear and Zilliax. - You can use Void Ripper to flip the stats of your active minions, instantly killing any unbuffed Goblin Bombs and sending an avalanche of damage into your opponent. - Drop Fungalmancer between two minions and they'll each gain an extra +2 / +2 of stats. - When Deathstalker Rexxar is played all enemy minions will take two points of damage. You also gain a new Hero Power which allows to combine the stats and effects of expired Beast minions into one new monstrous creation. - New Legendary card Boommaster Flark summons four Goblin Bombs onto the board, just waiting to be flipped with Void Ripper.